While Philip was traveling, he spotted an Ethiopian man studying the Gospel. 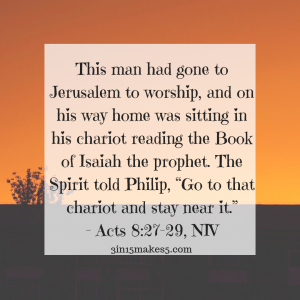 Immediately, the Holy Spirit told Philip to go to the man. He wanted him to approach the man’s chariot. So, Philip did, and as a result, that man came to faith in Jesus. He was even baptized before the Spirit of God whisked Philip away from the scene. The world is filled with people who, like the Ethiopian man, are hungry for God. They long for truth, but they need to be taught. They need someone to explain to them clearly the Gospel. Could you be that person today? Reach out to someone online and ask them what they’re doing and how you can pray for them. You never know what might happen when you follow the Holy Spirit’s leading. Lord, let me be sensitive to Your leading. I don’t want to overlook someone who is eager for truth. Give the words I need to explain the Scriptures to others. In Jesus’ name, Amen.